Horses that serve the sport of polo are often called polo ponies. When the sport originated, Manipuri ponies were preferred as mounts. They stood only 13.2 hands or 54 inches at the shoulder. The preferred height rose when the game of polo migrated to the West. Height limits were lifted entirely in 1919. Thoroughbreds and thoroughbred crosses are most often used as polo ponies in the United States. Polo ponies are a type of horse, rather than a breed. Polo ponies meet certain physical requirements. The ideal polo pony has a combination of speed, intelligence and endurance, as well as a love of the game. A polo pony must have strong leg bones to be able to carry riders at full speed and turn or stop at a second’s notice. 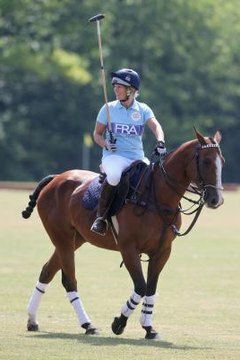 Many experienced polo ponies develop an ability to anticipate the roll of the ball and precede it to its destination. Today’s polo ponies are actually horses standing 16 hands, or 64 inches, at the shoulder, or more, though some still are much closer to pony height. The thoroughbred is a versatile horse breed commonly used as a polo horse in the United States. Many of today’s American polo horses are 75 percent thoroughbred or better. The thoroughbred's strong hindquarters give the animal speed. Breeding has given the thoroughbred stamina to carry the creature over long distances at high speed. Both of these traits are vital for the polo horse. The majority of English polo ponies trace their lineage back to Rosewater, a small English thoroughbred stallion. The typical American polo pony is a cross between the thoroughbred and the quarter horse. Like thoroughbred polo horses, these animals have the speed and the stamina to compete in the fast-paced game. Quarter horses are cutting horses, bred to be limber, agile animals for herding cows. Their agility enables polo horses of this crossbreed lineage to make quick directional changes. Like their quarter horse ancestors, these horses also have quick bursts of speed. The Argentine polo pony is a cross between the thoroughbred and a native Argentinian breed called the criollo. Like the quarter horse, the criollo is a working cow horse who as a polo mount lends his ability to move quickly and turn sharply as a competitive advantage. Unlike the quarter horse, the criollo is typically bred for endurance rather than speed. This crossbreed is also called the Argentine-Anglo.